Hyper locavore and relational eating! Locavores traditionally look for food within a 100-mile radius of their home. This can be challenge in some regions more than others, but what if that local circle was even tighter? Author Vicki Robin took the local eating challenge much, much, closer to home…10 miles! Documenting her experience in [amazon_link id=”0670025720″ target=”_blank” ]Blessing the Hands That Feed Us: What Eating Closer to Home Can Teach Us About Food, Community, and Our Place on Earth[/amazon_link], which will be released in just two days, Robin found relational eating helped reconnect her to her body and environment. 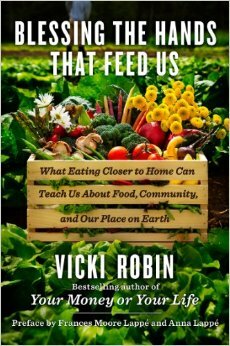 Taking the locavore movement to heart, bestselling author and social innovator Vicki Robin pledged for one month to eat only food sourced within a 10-mile radius of her home on Whidbey Island in Puget Sound, Washington. Her sustainable diet not only brings to light society’s unhealthy dependency on mass-produced, prepackaged foods but also helps her reconnect with her body and her environment. Like Barbara Kingsolver’s Animal, Vegetable, Miracle and the bestselling books of Michael Pollan, Blessing the Hands That Feed Us is part personal narrative and part global manifesto. By challenging herself to eat and buy local, Robin exposes the cause and effect of the food business, from the processed goods laden with sugar, fat, and preservatives to the trucks burning through fuel to bring them to a shelf near you. young, enthusiastic farmers living their dream of self-sufficiency; and Vicky, a former corporate executive turned milk producer. Featuring recipes throughout, along with practical tips on adopting your own locally sourced diet,Blessing the Hands That Feed Us is an inspirational guide and testimonial to the locavore movement and a healthy food future. Robin’s book contains recipes that inspire but are definitely not vegetarian. The creepy part is that when you realize how deeply you depend on another-be it a berry bush or a mate-you know your vulnerability to loss. You realize that control is ultimately an illusion. So much of what we eat and how we shop is an effort to control life and nature. Eating food out season, expecting to be able to buy watermelons in winter, it is as if we are saying, yes we have conquered the seasons and the natural order. One aspect of vulnerability I have experienced recently due to local eating came from raw almonds we bought at a farm stand in the Central Valley. The almonds introduced a pantry pest that caused ruination to my supplies. As a family, we talked about what if that was all the food we had for the winter? What if we didn’t have the ability to go buy food? [amazon_link id=”0670025720″ target=”_blank” ]Blessing the Hands That Feed Us: What Eating Closer to Home Can Teach Us About Food, Community, and Our Place on Earth[/amazon_link] is about so much more than just eating local. It inspires deep thinking and connections in the reader, as well as inspiration.